Something old, something new, something borrowed, something blue. This saying is as classic as can be when it comes to weddings. Although classic, there’s still room to have fun with your “somethings”. For my wedding, I knew I wanted to incorporate something from my dad into my day. He’s so incredibly important to me and I was determined to surprise him, being his first of two daughter to get married. So I asked my mom to sneak into his closet and take a blue shirt that he wouldn’t miss. I then had my seamstress cut a heart out of the fabric and sew it into the bottom layer underneath my dress. On the wedding day, I surprised him by showing him the heart when he saw me for the first time. It was magical. If you use a dark blue fabric, be sure that it won’t show through your dress. You don’t want guests to notice it unless you are purposely showing it off. To be safe, have your seamstress sew an ivory or white backing on the heart. When choosing placement for your heart, think of where it’s both appropriate and practical to show it off. I’ve seen these hearts sewn into the top of the dress, representing your dad’s heart on your heart. 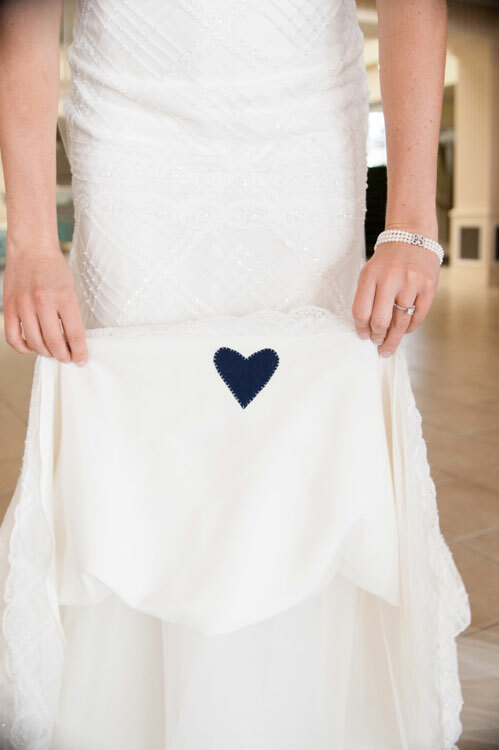 But think about this – how would you show your dad the heart once your dress was on? Flipping over the top of your dress is probably something both you and your dad wants to avoid. With it being sewn into the bottom, I could just lift and flip over the bottom of my dress. Choose the sewing style that fits you best. I decided to have the ivory thread seams show on the outline of the blue heart. It added a whimsical aspect to the design. If you want something more clean and modern, have the heart sewn so there are very little visible seams. I want to know – how do you plan to incorporate Something Blue into your wedding day?